Cellulose beads possess some adsorption capacities for heavy metal ions, but the effect of lignin remaining in the beads on the adsorption behavior is not clear yet. In this study, lignocellulosic and cellulosic hydrogel beads were prepared by ionic liquid (IL) dissolution and reconstitution in water and further functionalization through magnetization and carboxymethylation. 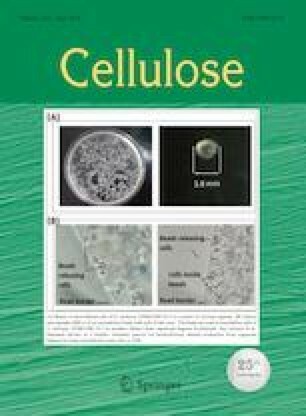 Compared to pure cellulosic beads made from Kraft pulp and microcrystalline cellulose, the presence of lignin in the lignocellulosic beads from IL-extracted cellulose-rich material (CRM) helped support the porous structure, leading to a higher hydroxyl number and porosity, and thus higher efficacy in magnetization and carboxymethylation. CRM beads, therefore, exhibited greater Cu2+ and Pb2+ uptake than the cellulosic beads both before and after modification. However, excessive lignin in the beads prepared directly from poplar wood powder caused negative effects on the adsorption capacity due to agglomeration and occlusion of the adsorptive sites. The online version of this article ( https://doi.org/10.1007/s10570-019-02328-w) contains supplementary material, which is available to authorized users. Yanjun Xie thanks the financial support from the National Key Research and Development Program of China (2017YFD0600204).